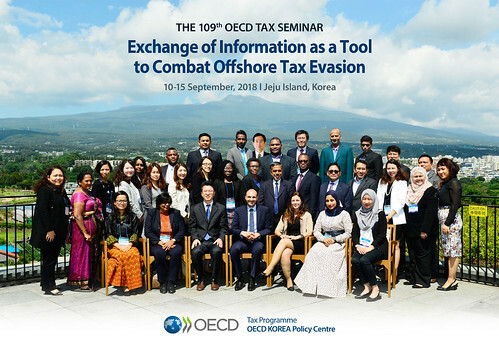 21/09/2018 - The Global Forum on Transparency and Exchange of Information for Tax Purposes (Global Forum) delivered a five-day seminar on “Exchange of Information as a Tool to Combat Offshore Tax Evasion” in Jeju Island, Korea on 10-14 September 2018. The seminar was hosted by the OECD-Korea Policy Centre as part of the OECD’s Global Relations Programme in Taxation. 30 officials from 15 jurisdictions attended this seminar which was led by the Global Forum Secretariat (Mr. Hakim Hamadi) with experts from the Asian Development Bank (Ms. Renata Fontana), India (Mr. Shibanka Das Biswas) and Japan (Mr. Kamon Yamamoto). This seminar focused on the connection between the domestic tax investigations, the domestic information gathering framework and the international infrastructure for exchange of information (“EOI”). Participants are being introduced to key concepts of transparency and exchange of information (EOI) as assimilated into the international standards: EOI on request, automatic EOI, confidentiality of data and beneficial ownership. Through a series of hands-on workshop exercises, participants were familiarised with the use of EOI networks and structures to improve the quality of tax audits and to combat transnational tax evasion. Tax auditors were encouraged to make effective use of these EOI tools by increasing the number and quality of outgoing requests to their treaty partners. The seminar has strengthened awareness among participants that protection of domestic revenue is closely linked with the effective use of this EOI network.